Energize your skin. – Dancing in the rain! One of the principles of my W.I.S.E Project for January is Energize. Nothing needs energized more than my skin. My skin is dry and I suffer roscea. I have tried everything and have found the best (and least expensive) luxury for my skin comes from all natural products I found in my home. I never used to exfoliate because I was told it could irritate my roscea. The wonderful and incredibly beautiful Christy Brinkley still gorgeous at 60 says her secret is exfoliating so I looked for recipes for a couple of quick exfoliators. I initially tried sugar and coconut oil. Easy and works well but week two I switched out the sugar for coffee grinds. Make your morning coffee and add coconut oil and a little bit of unpasteurized honey to some grinds. Try to use them within 1/2 hour while the grinds are still oxidized. Lightly scrub face. Now the trick is to exfoliate at the right time. Yesterday I exfoliated 1/2 hour before I left the house, I also used an apple cider toner. No no no!! Your new skin is sensitive so either exfoliate at night and let your skin breath for a bit or do so when you are not going anywhere. Don’t toner or put make-up over newly exfoliated skin. I burnt my face and it stung. It wasn’t pleasant. Lesson learned. 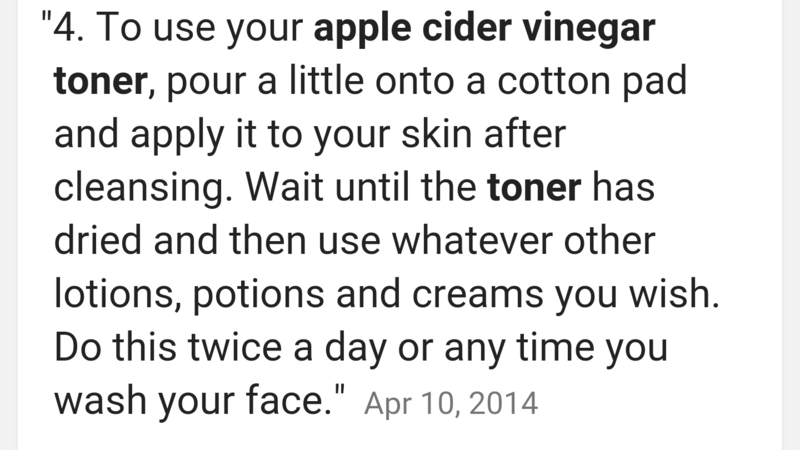 Apple cider vinegar facial toner made from raw, unfiltered apple cider vinegar balances the natural pH of the skin, clears away excess oils and make-up, and breaks up the bonds between dead skin cells (exfoliating) to keep skin pores open. It also can lighten sun and age spots, and can improve acne and acne scars.